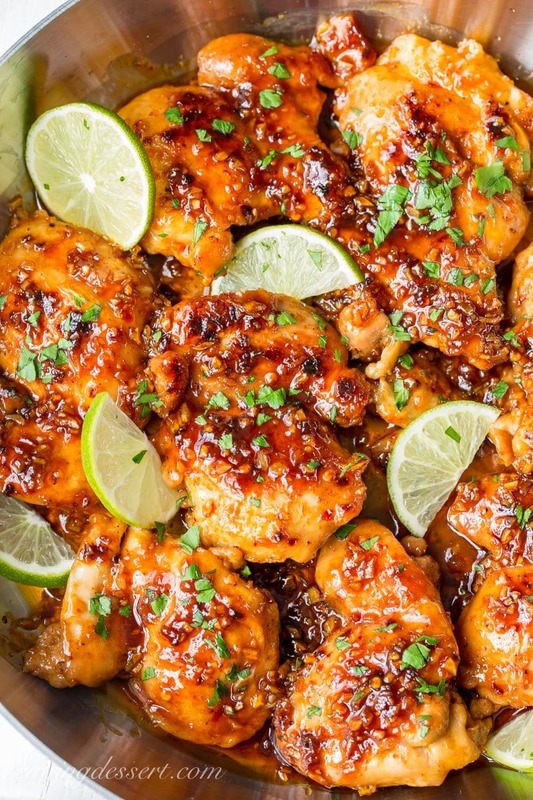 Enjoy this Easy Spicy Honey Lime Chicken Thigh Recipe made with boneless, skinless chicken thighs. 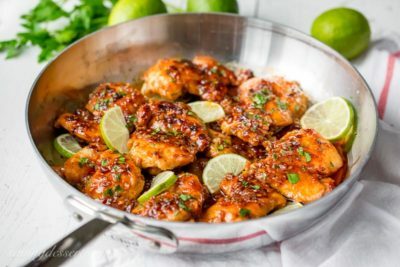 The chicken cooks quickly and is finished in a delicious garlic infused sauce that’s sticky, sweet and spicy, with a tart citrus tang from the lime juice. We’ve got so much flavor going on here … nothing boring about this chicken dinner! 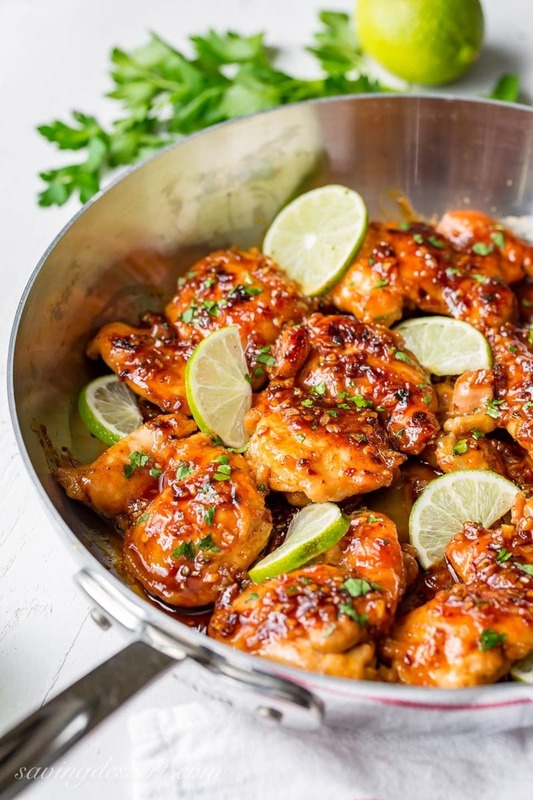 We were so thrilled with our Spicy Honey Lime Shrimp recipe, I knew it would be terrific adapted for juicy chicken thighs. To add a little more depth to the flavor, we brought soy sauce to the party which turned out to be the perfect compliment for the sweet honey and fresh lime juice. The spicy base comes from the dry Sriracha Seasoning but if you can’t find it in your store, feel free to use your favorite spice blend. If you’re on Amazon you can find the seasoning there too. Check out the link at the bottom of this post. These chicken thighs are best cooked in a non-stick skillet to avoid burning the sauce as it caramelizes. If you can wait to get the chicken to the table, it’s terrific served over rice or pasta, basically anything that will help you sop up every drop of the zesty sauce. Crusty bread works great too! Served with a side of steamed broccoli or oven roasted green beans, this chicken thigh recipe is super satisfying and very delicious! Garnish with chopped fresh parsley or cilantro leaves and sliced lime wedges. Do you know you can freeze chopped fresh herbs? I really hate to waste food and if I buy a bundle of fresh parsley or cilantro at the store, I want to use it all before it goes bad. If you have some in your vegetable drawer too, chop up the leaves and dump them directly into a airtight freezer safe container. The herbs don’t even stick together once frozen and even retain a good bit of their beautiful color. Whenever you need a garnish or a few tablespoons of fresh herbs, check the freezer for your stash! 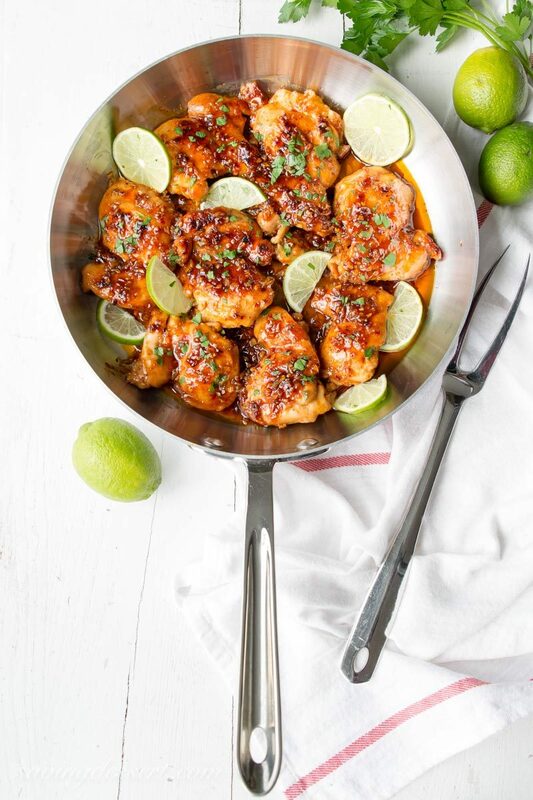 Boneless skinless chicken thighs cook up quickly and are finished in a delicious garlic infused sauce that's sticky, sweet and spicy, with a tart citrus tang from the lime juice. Combine the garlic, soy sauce, honey, lime juice, salt and black pepper in a small bowl. Stir to combine, set aside. Sprinkle both sides of the chicken thighs with the dry Sriracha seasoning blend. In a large non-stick skillet over medium-high heat, add the olive oil and heat until shimmering. Once the skillet is hot add the chicken thighs in a single layer. Cook the chicken until browned on both sides, 4-5 minutes per side. Reduce the heat to medium and add the garlic lime sauce and cook the chicken, turning and stirring occasionally, until done all the through, 7-10 minutes. The sauce will thicken and caramelize and reduce slightly. Sprinkle the chicken with crushed chili pepper flakes and parsley, if desired. Serve over your favorite cooked pasta or rice. Garnish with fresh lime slices if desired. We have several recipes featuring Sriracha seasoning so I guess it’s pretty obvious we love the stuff. One of our all-time favorites are these Grilled Chicken Skewers with a Sweet Sriracha Glaze, and if you’re looking for a great way to elevate the flavor of a mild fish fillet, try these Sriracha Grilled Mahi Mahi Fish Tacos. So much deliciousness in every bite! Finally, check out our recipe for Spicy Shrimp & Fried Corn and you’ll be amazed at the fantastic flavor combination in our nod to classic Shrimp & Grits. We’d love to try these Spicy Chicken Breasts from Center Cut Cook and these gorgeous Baked Sweet & Spicy Chicken Breasts from Creme De La Crumb. 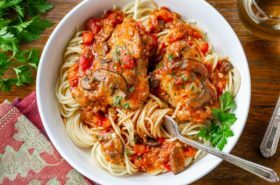 And I’ve been drooling over this recipe for Spicy Chicken from Giada De Laurentiis posted on Food Network. Have a wonderful week my friends! Thanks so much for stopping by. Mine did not come out as pretty as yours but it was so delicious! Thank you! Thank you for the feedback Katy! So glad you enjoyed it. Thank you so much for this recipe! 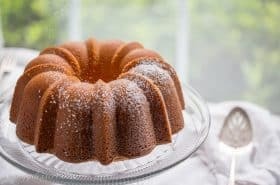 As a young adult that just moved out of my parents house this recipe was easy to follow and turned out amazing! I marinated the chicken in the honey garlic sauce for about 2 hours before cooking and it really added to the flavor. Congratulations on your big adventure Tiffany! So glad you picked this recipe to try. It’s perfect for young adults, who are working and need something easy and quick. Best wishes for a fabulous new year! I made this for lunch,doubled the recipe so we can have it for dinner too. I didn’t have the sriracha powder so I used the crushed red pepper flakes , added onion powder and sweet paprika, cut up the chicken into bite size pieces before cooking added the sauce per recipe and set it aside. I stir fried shredded cabbage, carrots and sweet peppers and seasoned it with oyster sauce and served the chicken over the cooked vegetables. For dinner I served the chicken over cooked Asian vermicelli. Both were super delicious. Wow Marylyn – this sounds wonderful! I love that you cut the chicken up and I adore cabbage – this is just brilliant! Thanks for sharing. Hope you’ll get some sriracha and try that next time – such great flavor. Thanks again. Could I cook this in the oven instead? If so, how long do you think the chicken would need to cook? Hi Heather! I have not tried cooking this in the oven. But I would think they need 20 to 25 minutes at about 350F. Not sure how this would work if you’re not stirring the sauce around. Also, I like to make this in a non-stick skillet so the sauce does not burn. I don’t think this will work as well in the oven, but perhaps it’s worth a try. Good luck and thanks! I made these to day. Yummy! I did not have the dry sriracha. I used Tajín Classico salsa en polvo with lime. I added fresh grated ginger root to the garlic honey mixture. Served the chicken and sauce over rice noodles garnished with cilantro and lime wedges. Served with cole slaw made with grated ginger root, red onion and lime olive oil dressing. Delish! Sounds great Michele – thanks for letting us know! I like the addition of ginger – yum!!! I made this tonight for dinner. I didn’t have any sriracha powder so I made my own chicken rub. I doubled the sauce part of the dish and made steamed vegetables and poured the sauce over the vegetable mix and cut the chicken for on top. My family loved it. Thank you. Thank you so much for the feedback Alberta – my family loves this too and I love that you included vegetables in the sauce. Spicy, sweet and juicy – all the things I love about this chicken! Thanks for the recipe, it was a quick and delicious meal! I couldn’t locate the dried sriraccha seasoning so I just used the sauce from a bottle and it was tasty. For the sauce, I added a small amount of corn starch to improve the thickening and sautéed onions and mushrooms for flavor. I just finished making this recipe. It smells lovely, but my sauce didn’t thicken or caramelize. I wonder if I did something wrong. I tried following the recipe as closely as possible. The only difference is the lime juice. I just used lime juice, I didn’t squeeze it from a lime. Hi Megan – I’m not sure what happened but maybe it was the bottled lime juice. I know honey varies greatly in thickness so maybe it just needed to boil down a little longer. I hope you enjoy it anyway. Please try again – and cook until it thickened. Thanks for trying the recipe! I made this with skinless, boneless chicken breasts, cut into fourths, because it’s what I had. I didn’t have sriracha powder, but used some sauce. It seemed bland to me so I also added minced onion, lots of fresh minced garlic and grated about an inch of fresh ginger in the sauce. At the end it still seemed a little bland so I added some chili pepper flakes and more honey and lime. If I make this again I will probably use thighs instead of breasts, add some sweet pepper strips and more onion, maybe broccoli, even more fresh garlic and hot peppers. It was tasty, but I’ve made better and this can be improved. I don’t mean to sound critical, but I’ve cooked for over 40 years. Thanks for the comment K. I think you would have found it to be much more flavorful if you had used the chicken thighs and the powered Sriracha seasoning. It is pretty intense and so good with the lime juice and honey. Your “new” recipe sounds great too – I may just have to give your version a try. Thanks for sharing and for reading the blog. Wooohooo! Thank you so much Marlene Sounds like you adapted it well. Sorry the Sriracha powder didn’t turn out – try making it really thin like in the photos. Marinating sounds wonderful too – great adaptation! Thanks for the feedback, so happy you and Mr. Fussy liked it. Hi there, what are the calories for 2 porttions of chicken thighs? I want to try this however I just started a fairly strict diet following my calorie intake. Thank you! I made this recipe tonight. What a great combination of flavors – it was a hit!! Next time I may garnish with sliced green onions. 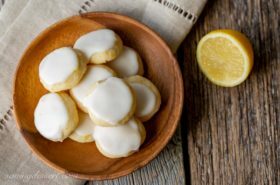 Fab recipe – thank you!! Yeah! Thanks for the feedback Sandy and for trying one of our recipes. We love this delicious chicken and serve it often. Thanks again … so glad you liked it! Recipe looks great, thanks! But … a question … you suggest using a non-stick pan … but your pictures look like stainless steel …? Or maybe you found non-stick that looks like stainless? I use only stainless but will give this recipe a whirl because it looks so dang good! Do you have the nutritional information for this dish (including carbs)? It sounds great! Hi Sarah – I do not have it calculated for this recipe. I am trying to get that added to my recipes. This recipe is a keeper and I hope you’ll give it a try. The chicken thighs were tasty and we loved the spicy flavor. The sauce thickens as described and was served over a rice blend. Even with the extra lime wedges the sauce seemed a bit too sweet. Not sure how to fix that. Any ideas? Hi Els. Thanks for the feedback. I guess you could decrease the amount of honey, but of course that will affect the sauce and how thick it becomes. If you add more lime juice that will also thin the sauce. We didn’t think it was very sweet, so maybe you had better honey? This looks delicious! Do you have the nutritional info for this recipe? Hi Val – no I don’t sorry. Hi Susan – I bet the lemon was really good, and brown sugar …yum! We love this chicken too. So easy and delicious 🙂 Have a wonderful weekend! 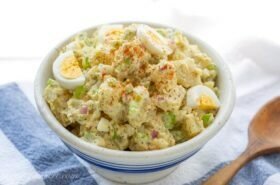 Another wonderful recipe, Tricia, it looks quite delicious. Thanks so much Amalia. Hope you are doing great! I tried the Spicy Honey Lime Chicken Thigh recipe and it was delicious. It wasn’t as pretty as yours, but tasted very good. Thanks for the recipes on your blog. Thank you so much for letting us know Karen! Our readers like to know how it goes. I really, really love this recipe and think about making it all the time – haha. Glad you liked it too and thanks for giving it a try! Hi Monique! If you have the sauce you can make this. Squirt some onto a baking pan lined with parchment or a silpat mat. Bake it in the oven at about 200F for an hour or so until it’s dried out. Crush it up and you have Sriracha seasoning! Thanks Pam – I wish everybody had Sriracha seasoning, there are lots of different brands out there. Must be a southern thing? Hope you get some and give this a try – so good! Thanks John – we’re really loving spicy foods lately! What a mouthwatering recipe Tricia! I love these flavors and can’t wait to try this delicious chicken! I always have chicken in the freezer and many nights I repeat the same dishes over and over! SO glad to have this delicious recipe to try—-and an excuse to pick up some sriracha seasoning!!! I am a huge fan of chicken thighs and are always looking for new recipes. 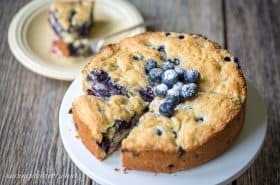 This one looks delicious, I have to try it. Thanks Gerlinde – if you like a full flavored chicken dish, this is the one – so easy too! I love spicy food and I haven’t seen that Sriracha seasoning, I’m going to look for it today! Me too – this is a winner for sure! Yes; I freeze herbs as well. This is perfect to use four seasons; also, pinned this lovely idea for week dinner. Thank you so much ! Love that you brought this great sauce to chicken, too! Looks perfect 🙂 Can’t wait to try this! Thanks Jennifer – this is sooo good! Chick thighs taste so tender and yummy even simply poached in ginger/onion water, let alone with a spicy, sweet and tangy sauce like yours…heavenly! Thanks Angie! My husband wants to know how often we can eat these delicious chicken thighs – so we will have it often! Happy Monday Tricia! This is not only a gorgeous looking dinner, the flavors sound fabulous. Yes, I would want to enjoy every little drop of that wonderful sauce! Thanks Chris! Hope you get to make it soon, it has so much delicious flavor. Thank you!